OYO Sports is a leading fan engagement company in the sports consumer marketplace, targeting the youth, fan and collector markets with both physical and digital toy products. OYO Sports creates buildable mini-figures that are designed as the replica of athletes, with facial and uniform representation of their real life counterparts of major professional sports teams such as Major League Baseball, National Football League, National Hockey League, Major League Soccer, over 60 major colleges and universities and more. 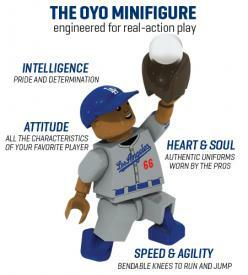 Each OYO Sports minifigure comes with his own stand and unique DNA number, as well as rotating arms, bending knees, and the ability to hold a bat, stick, glove and ball. OYO Sports is privately held investors include Mandalay Sports Media, Atlas Venture and Boston Seed Capital. The company is located in Marlborough, Massachusetts and all products are designed in Massachusetts and built with pride in America from U.S. and globally sourced parts. It all started at the ballpark. A father took his son to Fenway Park for a Red Sox game. Taking in the sights and sounds of the park, a true New England rite of passage, the duo would begin exploring the confines of the park in search of toys. As their searches went without results, an idea was born: Creating minifigures of athletes that kids could play baseball with at a game. What does the OYO name stand for? It's an OYO face! Two eyes, a nose, and a smile! Its easy to remember and easy to say for any age.